Cook the spaghetti according to package directions. Drain off the water. For tomato-mushroom sauce, in a skillet, cook green peppers and onions in the 2 tablespoons butter or margarine until tender. Stir in undrained tomatoes and bring to boiling. Reduce heat and simmer, uncovered, for 15 minutes. Stir in the mushrooms and olives. Meanwhile, for white sauce, in a medium saucepan, melt the 1 tablespoon butter or margarine. Stir in flour and salt. Add the whipping cream and milk all at once. Cook and stir until thickened and bubbly. Remove from heat. 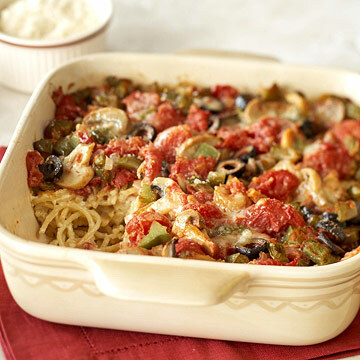 To assemble, arrange spaghetti in an 8x8x2-inch baking dish. Top with white sauce, followed by the tomato-mushroom sauce. Sprinkle with Parmesan cheese. Bake, uncovered, in a 350 degree F oven for about 25 minutes or until heated through. Makes 4 main-dish servings or 8 side-dish servings. How do we view ratings/comments?